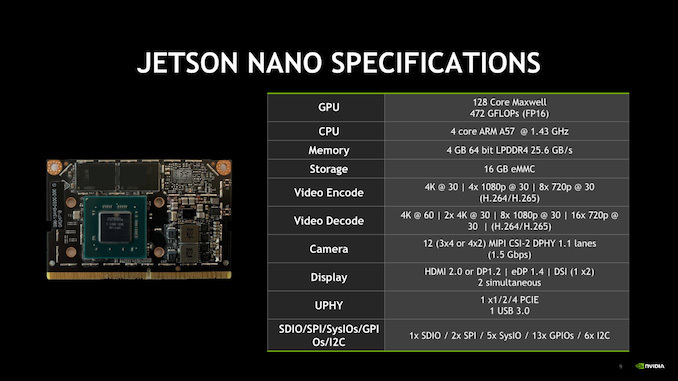 Today at GTC 2019 NVIDIA launched a new member of the Jetson family: The new Jetson Nano. The Jetson family of products represents NVIDIA new focus on robotics, AI and autonomous machine applications. The Nano module features NVIDIA’s “Erista” chip which also powered the Tegra X1 in the NVIDIA Shield as well as the Nintendo Switch. The variant used in the Nano is a cut-down version though, as the 4 A57 cores only clock up to 1.43GHz and the GPU only has half the cores (128 versus 256 in the full X1) active. The module comes with 4GB of LPDDR4 and a 16GB eMMC module.